This post is sponsored by The Little Potato Company. Thanks for supporting brands that make DK possible. My goodness do I love these tacos. And, I’m in good company. BL has asked for them at least twice in the past few weeks, which is always my litmus test on whether a recipe is good. How I ended up marrying the world’s pickiest eater, I’ll never know. Did I mention they are only four ingredients and take 15 minutes to make? These might be the taco recipe to end all taco recipes. Obviously, we’re big fans of Mexican food. Living in California for a decade will do that to you. Guacamole is it’s own food group, Tapatio goes on everything and tacos are at least a weekly menu staple. The great thing about tacos is that almost everything works. I’ve made tropical, Korean, spicy black bean, and breakfast tacos… and that’s just in the last year. These potato tacos are no different. Crispy potatoes, spicy soyrizo and pico de gallo. I like using pico de gallo as a base so I don’t have to chop anything– the tomatoes, onions and peppers are already there for you. Don’t substitute jarred salsa as it won’t work. Instead, add a bit of onion, diced jalapeno and tomatoes instead. 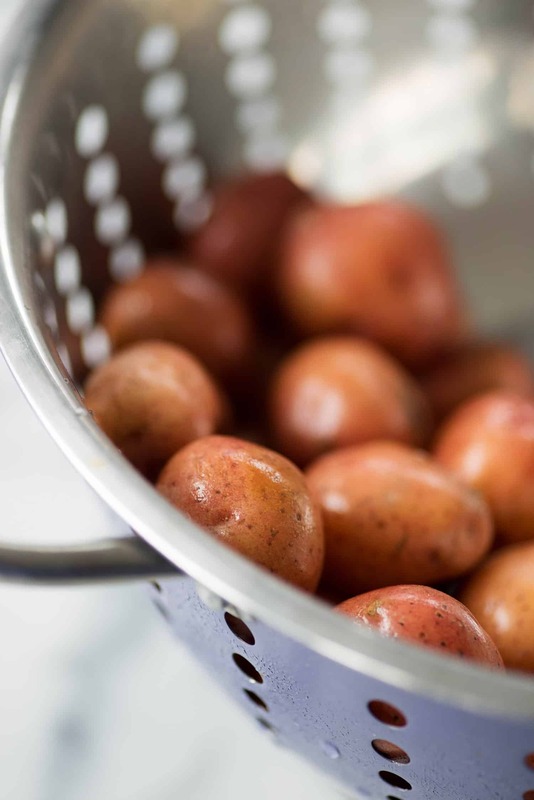 To make meal time even easier, I’m relying on my favorite potato: Blushing Belle’s from The Little Potato Company. 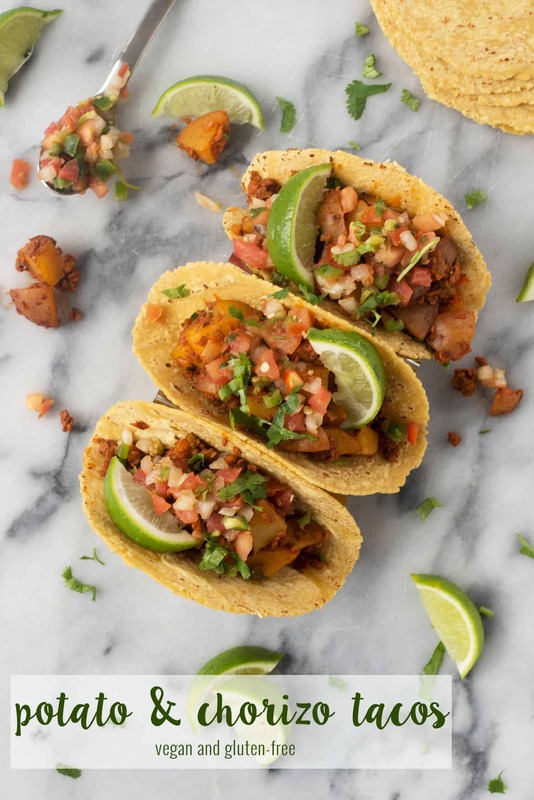 Their petite size is perfect for cooking quickly, the secret to getting these tacos on the table at lightning speed. Blushing Belle’s are packed with vitamins (B6, potassium, vitamin C and copper just to name a few) along with fiber and antioxidants. 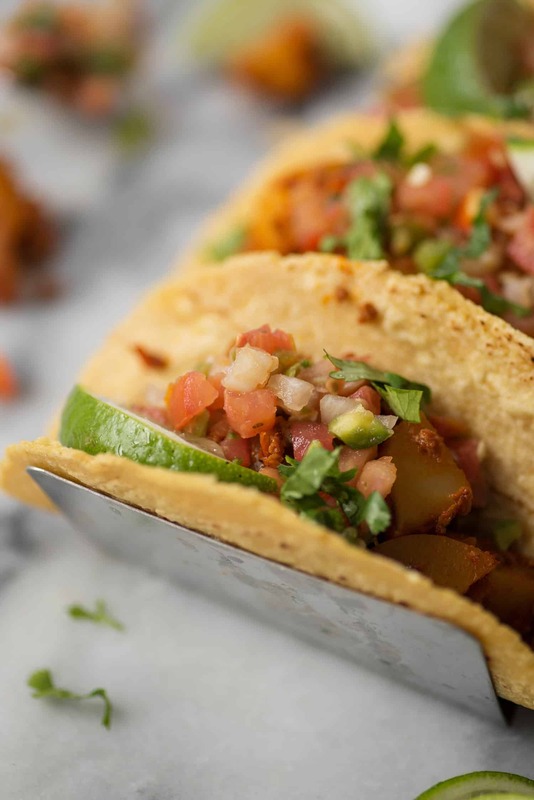 It’s why I love eating potatoes in all forms, but especially in these tacos. While we tend to think of spices, fruits and green vegetables are great sources of antioxidants, don’t forget about the potato. They contain a variety of carotenoids and flavonoids, which help protect against free radicals. Creamer potatoes are also fat-free, sodium-free, cholesterol-free, gluten-free and 20 calories each. 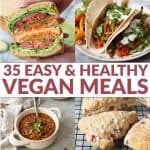 Vegan Tacos! 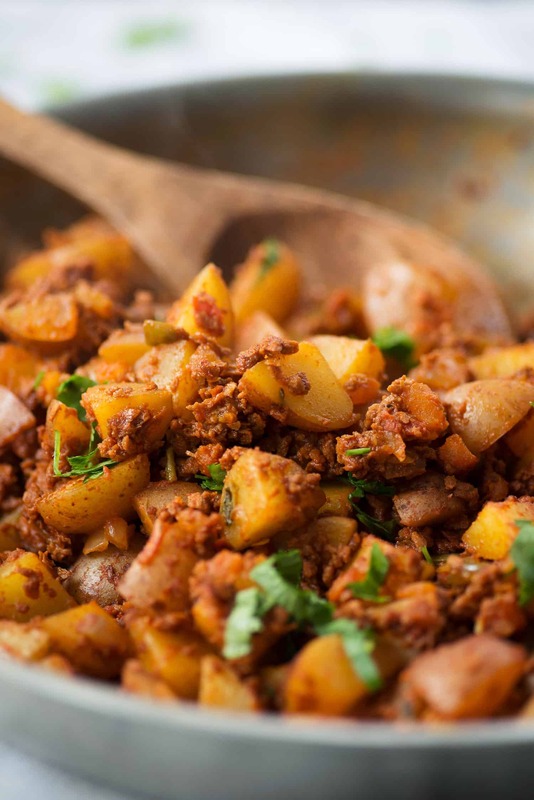 Potato and chorizo. 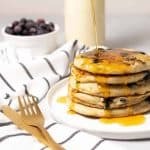 So easy and ready in just 20 minutes. 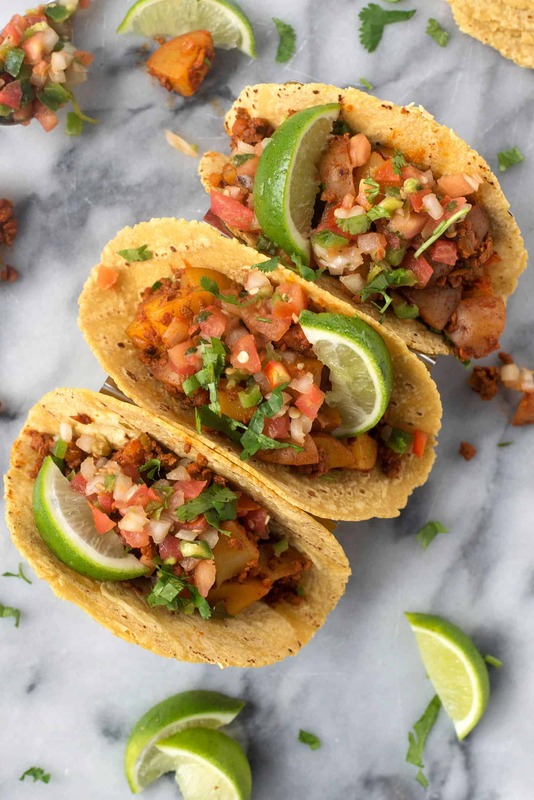 These are the best vegan and gluten-free tacos. 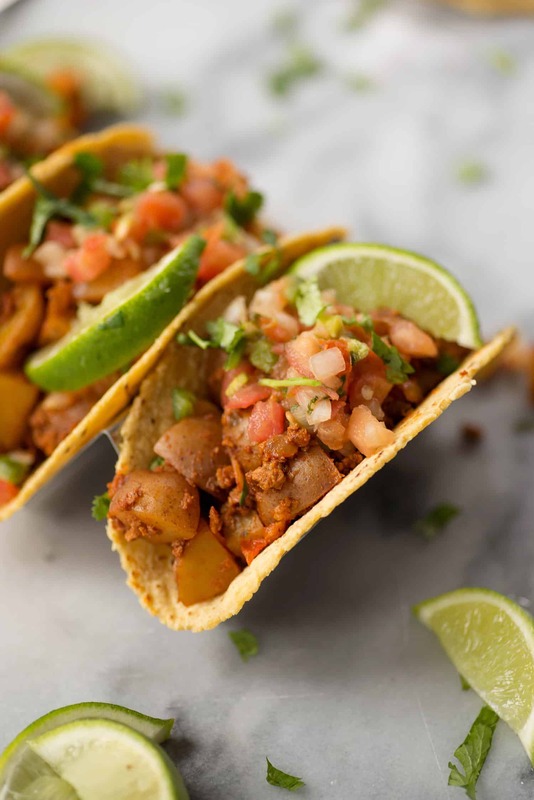 Spicy soyrizo with crispy potatoes and pico de gallo, served with corn tortillas. Quarter the potatoes and place in a soup pan with water covering the potatoes by 1 inch. Bring to a boil, then reduce heat to low. Simmer for 5-8 minutes, until potatoes are just tender. Drain. Add the potatoes and cook another 5 minutes, stirring often. Stir in the cilantro and season to taste, if needed, with salt and pepper. (I think soyrizo is fairly salty, so I don’t add much).